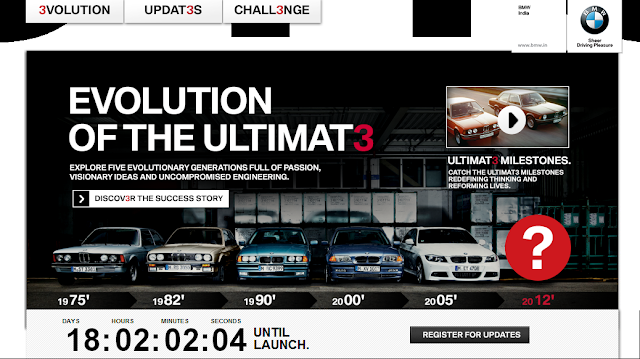 BMW 3 series to be launched on 03rd August. As per the company's website, which they have created a new microwebsite the carmaker has placed a countdown timer for the launch. The 3 Series will be assembled through completely knocked down(CKD) kits at BMW India’s Chennai assembly plant. The car is expected to be first launched in diesel-only guise with petrol engined variants to follow soon after. The highly acclaimed 2 liter, four cylinder turbo diesel engine pumping out 184 Bhp of peak power and 380 Nm of peak torque will power the 2012 F30 3 Series. This engine will propel the car to a top speed of 235 Kph, with acceleration also being very impressive at 7.5 seconds for the 0-100 Kph sprint. The engine will be mated to a choice of a 6 speed manual and an 8 speed automatic gearbox. The pricing information is still unknown at this point of time, however stay tuned for all other details for the launch on 03rd August 2012.